I remember the first time I went to Enchanted Kingdom. It was during first year high school and with my barkada (not Squad!). EK was actually the place for us to celebrate our birthdays. We would either be just girls or sometimes with the boys (so meron kilig factor, LOL!). Our top 3 rides at the time were Anchors Away, Space Shuttle and Log Jam! 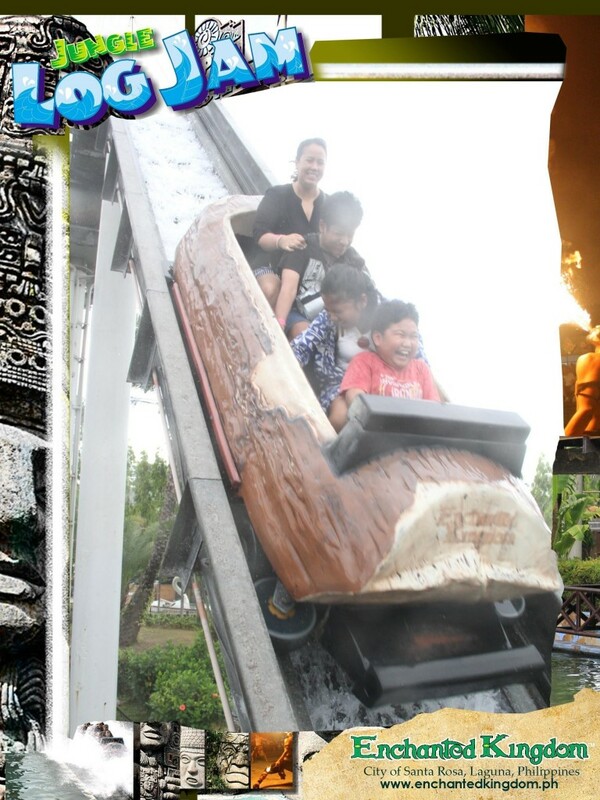 Each visit to Enchanted Kingdom, we would ride Log Jam at least 5 times (and pose for the photo!)! Super fun, those days were so simple and we were so happy to have a world-class theme park so nearby! Fast forward to a couple of weeks earlier, when I received a message from Anna Mamon, Head of Business Development & Partnerships for Enchanted Kingdom, to join them for their event entitled #EKMoms. Of course I jumped at the chance! Sancho had a couple of weeks left before going back to school and EK will always be a happy place for me. I also couldn't wait for that bonding time with Sancho! My husband had a flight that day so I invited my good friend, Sansan and her family (her kids are really good friends of Sancho, since birth!). Sancho is an only child, so he always asks for company other than us boring adults. I couldn't deny him that, in a happy place such as Enchanted Kingdom! #EKMoms (EKstraordinary Moms) was a Mother's Day Treat last May 20, 2018. We started off the day with a special tour of their newest ride, Agila the EKsperience. It is proudly the first and only flying theater in the Philippines. Agila is the tagalog word for Eagle. Agila the EKsperience was a captivating journey that takes you soaring around the Philippines' archipelago as if you were an Eagle. It honestly made me fall in love again with my country and reminded me that there is much to explore and share valuable memories with the family in our very own country. Agila plushies and Eldar the wise wizard in the gift shop. From left to right: Sansan, Tristan, Sancho, me and Zoe. After lunch Mr. & Mrs. Mario and Cynthia Mamon, founders of Enchanted Kingdom, shared a few words on how this vision of theirs came to be. I was really shocked when they said that Enchanted Kingdom has been open for 23 years now! Wow!!! Mr. Mamon's family is very involved in the business, from their own children who help run the company down to their grandchildren who perform on weekends at Enchante: Academy of Enchantments. You can truly see the love and faith that goes into what they do. This is why I think they have been successful in bringing joy to the Filipino people all these years. They built Agila the EKsperience last 2016 but it was just the first peak of a 10-year expansion plan for Enchanted Kingdom which will include the redevelopment of the existing theme park and addition of new zones, a regional convention center, a water park, etc. How exciting! We tried out some of the games! I won a donut pillow cause I got the rubber chicken to go inside the pot! Of course, if there's "cooking" involved I'm suddenly confident. LOL! Such a classic ride! Sancho, Zoe and Tristan had fun here. And yes, the magic does stay with you!